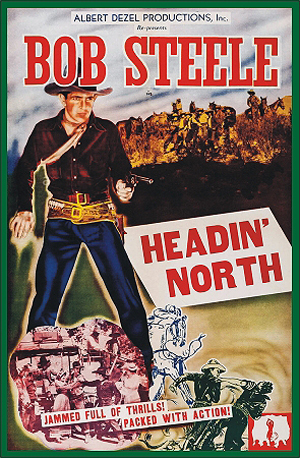 HEADIN’ NORTH (1930, Tiffany) Bob Steele, Perry Murdock, Barbara Luddy, Eddie Dunn. Bob is a fugitive out to find the culprit who unjustly caused him to go to prison. He and his pal flee a posse on horseback. Later, they disguise themselves as stage actors. In one amusing scene, Bob actually does a song and dance sporting a derby hat! Of note is the use of background music, unheard of for B westerns in 1930. Great fights and lots of action. Recommended. 35mm. CAVALRY (1936, Supreme) Bob Steele, Frances Grant, Karl Hackett, William French, Earl Dwire. A little different than the usual Steele western, and quite good, too. Bob plays a Cavalry officer who comes to the aid of a blind southerner. Later, he heads west to stave off an attempt by Hackett’s rebels to set up an independent state. Released by Republic. 16mm. DOOMED AT SUNDOWN (1937, Supreme/Republic) Bob Steele, Lorraine Day, Warner Richmond, David Sharpe. Well-made Bob Steele western-actioneer. Bob is being initiated into a secret fraternity of mischief-makers when he gets word that his father, the sheriff, has been fatally stabbed. He jumps in the saddle and tracks the murderer down. His only clue is that the killer is left-handed. From 16mm. DURANGO VALLEY RAIDERS (1938, Republic) Bob Steele, Louise Stanley, Karl Hackett, Ted Adams. A sinister hooded bandit "The Shadow" has been robbing and murdering off Durango Valley settlers. The local sheriff seems powerless to stop him. At one point, he hires two new deputies, but they turn out to be undercover thugs for the Shadow! Things change when Bob drifts into town. 16mm.